Are you looking for the perfect place to host an event? Hedge Farm is your venue! 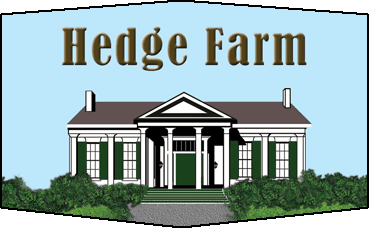 Hedge Farm is located about 20 minutes from Memphis, 10 from Holly Springs, and 35 minutes from Oxford. It is a one-stop shop for your venue and event planning needs. The homes' historic charm and classical style creates the perfect ambiance for both intimate gatherings and large celebrations. We specialize in customizing events to your exact needs. With the various unique and inspiring areas on the property, our staff is thrilled to coordinate and service all types of special events, including wedding receptions and ceremonies, corporate cocktail events and luncheons, rehearsal dinners, social gatherings, formal events, proms, birthday parties, baby showers, fashion shows, vow renewals, concerts, non-profit events and more. The private vistas extend across meadows and fields where the horses graze, to woodlands, ponds and creeks. In our hectic world Hedge Farm's seclusion demands that you slow your pace, catch your breath, and relax. What Sets Hedge Farm Apart? Simply said, authenticity, uniqueness, and honesty in design. Others may try to duplicate the sense of timelessness and southern elegance that exists here, but most fall short. Schedule a consultation and see for yourself!